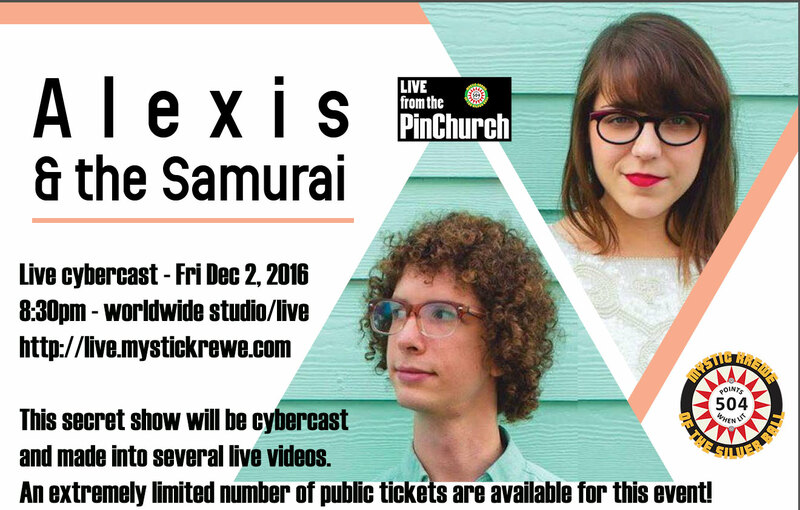 The Mystic Krewe is very excited to present our 8th, “Live from the PinChurch” show featuring the amazing talent of “Alexis & the Samurai” – These two local artists have been featured everywhere around the world, and will be performing in our very special, very intimate studio for a live cybercast and show. You do NOT want to miss this one if you have a chance to get one of the very limited tickets available. Exiled after having lost everything in hurricane Katrina, Alexis Marceaux has spent the last decade returning home and building up a career from scratch. The meantime has been hard-fought but fruitful, with appearances at The New Orleans Jazz & Heritage Festival, Voodoo Music Experience, SXSW, and several tours of the US and Europe. Alexis and bandmate Sam Craft met in 2009 and initially teamed up for Alexis’ sophomore effort Orange Moon (2011). Under the tutelage and engineering of The Polyphonic Spree’s Rick Nelson, the duo drew an all-star cast, 25 of NOLA’s finest musicians of every genre for a big, lush, indie-pop opus with a distinct Louisiana flavor. Marceaux put out her solo release Dandelion in ’09, and its songs were picked up by various television shows (MTV’s The Real World, E!’s Keeping Up With the Kardashians, and others), but with Orange Moon, she’s elevated herself into a “songwriting force to be reckoned with” (No Depression), securing more media placements, as well as rotation in Starbucks cafes and other stores. The duo will be on the road in the next several months in support of their brand new LP Move Into View. This event will be broadcast one-time-only live, and there will be a small number of tickets available locally. See below for details on tickets. If you are local to the New Orleans area, we have a VERY LIMITED number of tickets available to this special event. Try the form below to order tickets. If you are able to order, you will receive an e-mail a few days before the event with details and instructions on how to attend the show. This is a special, private party in a very special venue. If you’ve been to one of our Live from the PinChurch shows, you know how special they are. 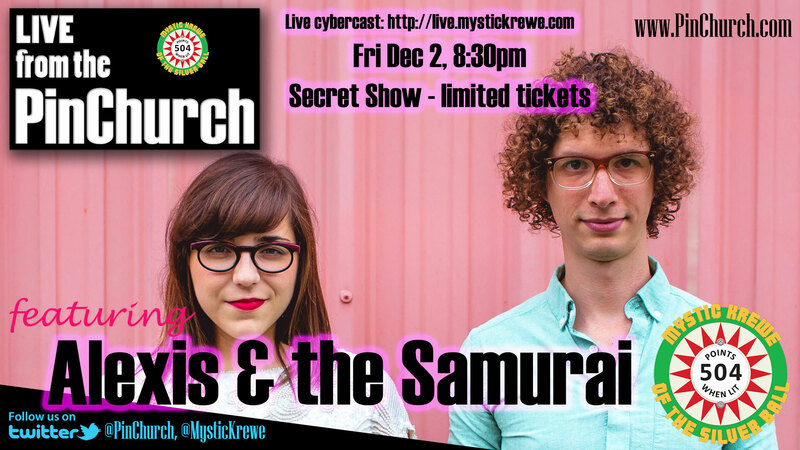 It’s a chance to see an amazing band in a very intimate setting and also enjoy the South’s largest private arcade (and all the other hospitality that comes with it) which is normally not open to the public. Help support the Mystic Krewe and have a wonderful night of entertainment! Ticket booth is now closed. Thanks!